What can you do to help continue the powerful force of live guitar music I hear you cry? Well look no further: here’s some handy pointers to help get guitar music back at the forefront of the industry – exactly where it should be. Well, this is pretty obvious, but do as the header says: get yourself to a gig. Theres nothing better feeling than swaying in a dark cosy room amid a sweaty crowd. Bands take heed – this includes you. 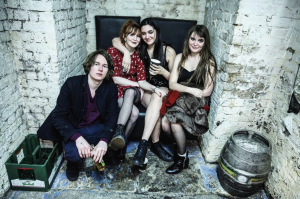 Members of Sheafs, Bang Bang Romeo and Blackwater’s are shining examples on the Sheffield music scene for supporting local and travelling bands even when they aren’t on the bill. Whilst the internet is a great resource for listening and discovering new music, this form of support has its limitations and bands inevitably need to be seen live so they can connect with the very people who are listening to them. So check out your local gig listings. Locally in Sheffield, Cafe Totem, The Picture House Social, The RS Bar, The Harley, Record Junkee and Frog and Parrot are a hub of local and national emerging talent. In London? Try WaterRats, Nambucca and The Monarch. In Manchester, brand new venue Night People is bursting at the seams with some of the most popular bands on the unsigned scene. One of the main issues impacting on live music today and where you are needed most, concerns the fact that grassroots venues are run on very tight margins, and have been under pressure for some time. They need your support – use them or lose them. A quick google search will pull up gig listings and venues in your area or visit http://northern-exposure.co/gigstickets/ for our handful of special gigs we put on through the year or visit This Feeling www.thisfeeling.co.uk for regional weekly listings of the best upcoming talent in the UK. I cannot reiterate enough that supporting other bands and anyone on the scene is paramount to keeping ‘live music’ just that: alive. Bands: social media plays a huge role in promoting your reputation as a group and growing your fan base. I know some musicians and fans have a deep-seated fear of annoying their Facebook friends as we probably don’t know 50% of the people on there personally. While I’m not saying make a career out of it, the occasional share here and there of a band you think is decent isn’t going to raise the Roman Army from the dead. If you are in to music and are in it for the right reasons, they get it and an invite or a share isn’t going to curdle anyone’s milk on their cornflakes. As the thoughts race around your brain screaming – HOW CAN I HELP!? The following can make all the difference. Following a band, promoter, venue, photographer on Facebook? Like their posts as they pop up on your newsfeed. With Facebook’s new algorithms, interaction and engagement with these pages are really important. Feeling really dangerous? Comment on posts or share them. You could also invite your friends list to ‘like’ the page. Go on, spread a little positive karma. Whilst I agree, that some bigger venues don’t do much to help support bands by charging extortionate prices for a pint, the bands on the support slots are on there for a very good reason and worth that extra few quid in beer money. Nine times out of ten, these are some of the hardest working, talented upcoming bands that have toured extensively on the unsigned scene and have finally been giving a chance to perform to bigger crowds – that’s if people turn up to watch them of course. I remember watching Biffy Clyro as a support band – now look at them. You could be missing out on some real gems by arriving late. So next time you book that next gig ensure you get there early. Befriending fellow musicians is probably one of the most rewarding things you can do as a band and for the scene in general. By staying and watching each other’s shows, buying their music and supporting them can go a long way in building a solid fan base for you and for them, possibly making new friends in to the bargain. Talking to the audience between bands and introducing yourselves creates a buzz around your band and encourages new fans to take a listen to your music. Think along the lines of ‘How do I wish we were supported?’ then take the plunge and do it. This also bleeds into social media, lose the ‘it’s all about us’ attitude and if you hear a band’s latest track and think that’s banging give it a share – you may need to sit down for this last bit – on your band’s Facebook page. I know everyone is busy, I know everyone is chasing their dream and trying to make a living but don’t underestimate the power of a little humility. Showing willing and sharing others’ work and attending shows never goes unnoticed. Many bands overlook the importance of this when building their band’s reputation and fanbase then wonder why when other bands hit it big they don’t get invited to support them on tour or at gigs. It’s a no brainer. Some folks may be sat in a pit of despair right now thinking what an arse they are for not supporting their fellow musicians. All is not lost, just take on board my advice above on how to be a good comrade for the future. The music industry is one of the most competitive industry’s in the world. Making a living in this game can be extremely hard especially at grassroots level – but keeping it kind and professional is most definitely the way forward. One of the key aims of Northern Exposure is all about the spirit of collaboration and NOT competition. We have built our foundations on this mantra: this is massively important to us and it’s so refreshing to see so many organisations these days working together in unison rather than against one another. I know from experience that new faces on any scene can feel to some like people are trying to move in on their patch – that’s not usually the case. The best way is to welcome them and try to help them – as this gesture will almost certainly be repaid. When I put on a gig with a band that I know another promoter works with, I liaise with that promoter. This isn’t something I think will catch on quickly but personally I’m not here to ruffle anyone’s feathers – I’m here to put on great gigs and work in a music scene that focuses on good vibes. Remember a welcoming face at the barrier when you first start taking pictures, advice from someone who has more experience or an introduction whilst out at gigs from a fellow promoter can go a long way – trust me I’ve been there. My initial experiences were not great but they got better when I met people on my wavelength. A valuable piece of advice I was once given was ‘work with those who want to work with you’. Starting out? You’ll quickly get a feel for who those people are. When it comes to writing, we all want to write the best articles, we want to be at the top of our game but we don’t have to tread over people to do so. Friendship, support and word of mouth is vital on the scene. It doesn’t matter if you are putting out the most journalistic pieces of writing – if your heart’s not in this for the right reasons then sooner or later that could bite you on the arse. When we first set up, people just couldn’t get their head round our ethos of collaboration – I hope to be an example of what this ethos can achieve. Apart from key staff which we all obviously need, I have always encouraged people who write for us to set up and build something of their own – because in my opinion the more of us the better. Especially when it comes to the younger generation, these young lads and lasses are so important to keeping the scene alive down the line and should be fully supported and encouraged. Helping other people out in the same line of business as you and joining forces (or dare I say the word ‘networking’) need not be painful. Meeting fellow promoters and chatting about how you can work together in the same town or city can go far in building your brand and help to get new music out there – because at the end of the day that’s what we all want isn’t it? Want to help? Are you a budding journalist? Are you handy with a camera? Want to help out the homeless by putting on a Musicians Against Homelessness gig? Webzines like ourselves are always on the look out for new people (novices and the more experienced) who are interested in helping new music and joining the team. Promoters are always looking out for people to help with marketing and staffing gig nights on the door and/or behind the scenes. Earlier this year, indie unsigned heavyweights This Feeling put out a call for people to get involved with them to help in a number of ways, offering free guest list for any of their nights up and down the country. You just need to email get_in_the_zone_@outlook.com to find out more. For Musicians Against Homelessness email mahgigs@gmail.com You can also contact ourselves on contact@northern-exposure.co if you are interested in working with us. If you take just one thing onboard out of this article we feel the whole scene will benefit and will continue to flourish.